17645 W645RND Whitley Bay Seasider | Flickr - Photo Sharing! Stagecoach North East open-top Dennis Trident/Alexander ALX400 17645 W645RND is pictured here on the Promenade in Whitley Bay, passing the Spanish City, while operating it's branded Coastal Service towards North Shields Ferry Terminal. 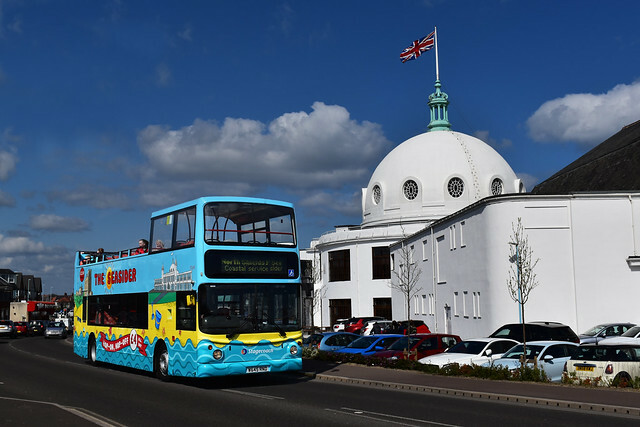 This year Stagecoach has launched the "Seasider" service which takes in the sights of the North East's coast from North Shields Ferry Landing through Cullercoats, Tynemouth and to Whitley Bay. The launch of the coastal service coincides with the end of the company’s City Sightseeing franchising agreement, with the open-top deckers being redepoloyed onto this new route to engage with a new customer base on the North Tyneside coastline. At £4 for an all day ticket, people are able to 'Hop-On and Hop-Off' at various attractions such as Whitley Bay's regenerated Spanish City, which houses a selection of restaurants, cafes, bars and markets, the Tynemouth Priory and Castle, Tynemouth's Blue Reef Aquarium, Tynemouth Market and Whitley Bay's Storm Cellar bottle and tasting shop. Passengers are able to take advantage of special offers at these attractions with exclusive "Seasider" ticket savings. The Seasider operates from North Shields Ferry and runs every half hour through the day every Saturday, Sunday and Bank Holiday, making 12 journeys each day - plus every day during the school holidays in May, July and August. 17645 was new to Stagecoach Manchester. and is joined on the route with 17239, 17240 and 17643. All are in Seasider livery with the exception of 17643, which is still a Seasider spare, but is painted white for future advertising vinyls and for private hires. © All rights reserved. Images are copyrighted to myself. Photographs lifted from my photostream and being reused elsewhere without my permission or being credited, will not be tolerated. Links to the image on Flickr may be posted. alex.sleight, lewiswishart1, and 20 other people added this photo to their favorites.